Well, who knew? There's such a thing as maneless lions, and they live in the Tsavo region of Kenya. Some real-life rogue man-eaters were featured in the 1996 movie The Ghost and the Darkness starring Michael Douglas - except that for aesthetic reasons (and, cough, safety) they used regular, and less aggressive, maned lions for the filming. 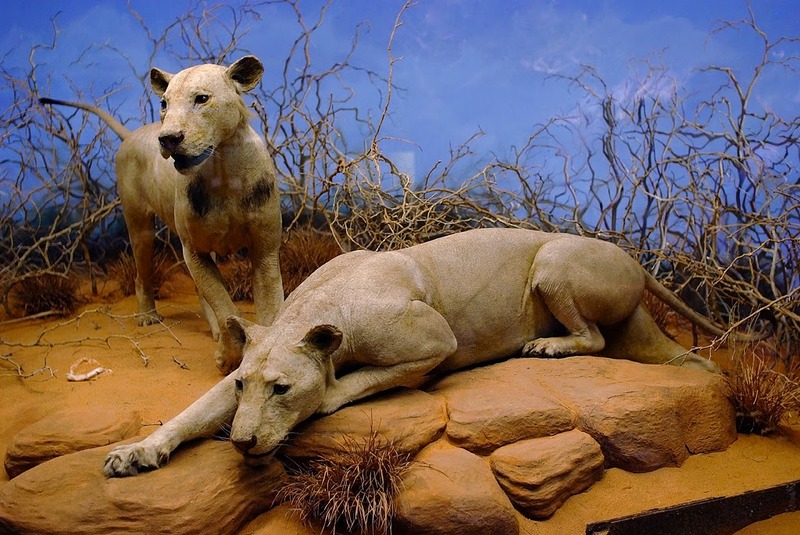 These are two of the real man-eaters, now stuffed in both senses and on display at the Field Museum of Natural History in Chicago, which I hope I will have the time to visit either in April when I'm there for a conference, or in October, when I'm passing through the city again. Having learned about these fellows, I'm particularly glad that it was a pride of maned lions that I looked at from a distance of just five or so metres, as I stood in the back of a ute with a dead and very bloody impala at my feet. Even so, they were looking back at me with a very considering sort of gaze, and I put all my faith in the quick reactions of Kevin, the manager of &Beyond's Phinda Private Game Reserve where we were staying, and who was behind the wheel giving me a less conventional guest experience. Though even regular game drives there always begin with the ranger saying, "I'll just get my rifle, and then we can go." The most beautiful big cat we saw was a lone male with an immaculate mane, who just lay and posed, which really is preferable, when you're up very close, to any sort of action - but though that was special, the most exciting bit of my too-short stay at Phinda was chasing a family of cheetah as they ran down a nyala. Even our ranger guide was whooping with excitement as we bounced along off-track in the Landrover. It was impossible in those conditions to get a clear photo, with my camera and especially with my (lack of) expertise, but I'm still pretty pleased with the shot I got. I'm thinking arty - how about you?